Learn about Steer and how we can help your business. Steer’s major shareholder is Gjermundshaug Group, a Norwegian construction company with roots back to 1949. It is owned and operated by Ole Gjermundshaug; grandson of the founder. Gjermunsdhaug Group has a yearly turnover of 75 million USD. The minority shareholder is Degree Consulting Group AS, a software development company. Degree is owned and operated by Njål Gjermundshaug; Ole’s brother. Degree works with development for both inhouse products and clients throughout Scandinavia. Degree has a yearly turnover of 6 million USD. 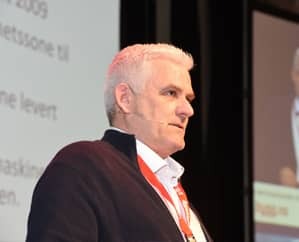 Ole knows the ins and outs of the construction business in Scandinavia and his company have worked for both the Norwegian and Danish Armed Forces for over 10 years with remote controlled equipment developed by Steer. Every machine fitted with the Steer Remote Control system is rigorously tested by Ole personally or one of his key personnel. Njål holds a master’s degree in Informatics and Artificial Intelligence from NTNU in Norway. 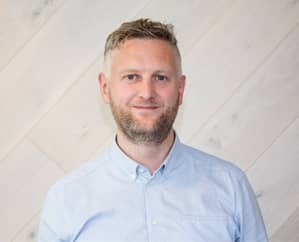 He is one of the founders of Degree Consulting Group AS, and also owns and operates some very successful cloud services such as Filemail.com. 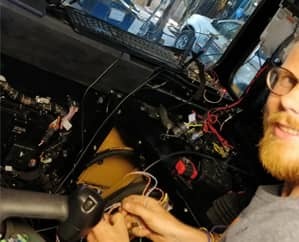 Njål and his crew is responsible for all the software development at Steer - and also for the autonomous technology that will be released in 2019/2020. Lars is one of the lead engineers at Steer. He is an electronics wizard responsible for manufacturing the Steer hardware, as well as the software running on these devices. He is a key player when it comes to installing the Steer Remote Control product on new equipment. Gjermundshaug Group has received monthly requests from mining and construction companies around the world wanting to acquire the technology to automize their operations. From being an in-house product used by Gjermundshaug Group exclusively - we are now ready to offer the technology and solutions to the market - via the company Steer. In 2008 Gjermundshaug Group won a large tender for the Norwegian Armed Forces. The job largely consisted of cleaning up a decommissioned artillery range used by the army for over 50 years. The artillery range was over 165 km2 - an area larger than Washington DC. The area contained a large number of undetonated bombs/shells, so excavation had to be done via remote control in order to clean up the area safely. Gjermundshaug Group were unable to find any business´ already having the necessary technology for running machines remotely, and therefore acquired several tech companies in Norway to develop an in-house solution. 6 months later - several remote-controlled Caterpillar excavators were operational in the artillery range and the tedious cleanup process started, which is still being worked on today. Operators are located 10 kilometers away - safe and sound from the explosives. A few years later - articulated dump trucks (ADT) from Caterpillar were introduced into the project - moving dirt and explosives to assigned areas. The dump trucks were initially remote controlled by operators - but it was soon decided that this could be automated - so an autonomous system based on GPS were developed and installed onto the ADTs. The dump trucks now drove 7 kilometers by themselves, freeing up operator time to focus on loading the trucks and manually controlling the ADT’s at the location where the dump was loaded. Through this change in operations, it was discovered that the autonomous ADT’s outperformed the remote controlled and operator driven ADT’s as they could drive significantly faster. Over 500 metric tons of undetonated ammunition and metal scrap has been removed by the Norwegian Armed Forces and Gjermundshaug Group since the project started in 2008, and it’s expected that it will be perfectly safe to visit the area in 2020. During the last 10 years, the decommissioned artillery range has been gradually reverted back to its natural state with no remnants of military operations. During these years, representatives of Caterpillar in the US visited the work grounds several times to see the Steer system in action. 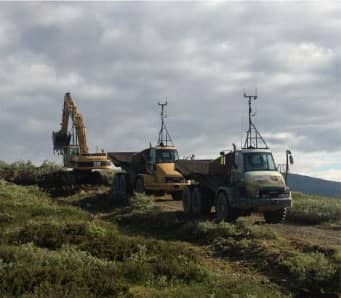 Similar cleanup jobs have been undertaken by Gjermundshaug Group for the Norwegian Armed Forces, Danish Armed Forces, PEAB, Orica and Dyno Nobel ASA, using remote controlled machines built by the people behind Steer. We´ve been working steadily for over 10.000 hours - moving over 200.000 cubic meters of dirt.